Excerpts from Nicolai’s Die lustigen Weiber von Windsor, Verdi’s Simon Boccanegra, Cilea’s Adriana Lecouvreur, Bizet’s Les Pêcheurs de perles, Berlioz’s La Damnation de Faust and Gounod’s Roméo et Juliette. 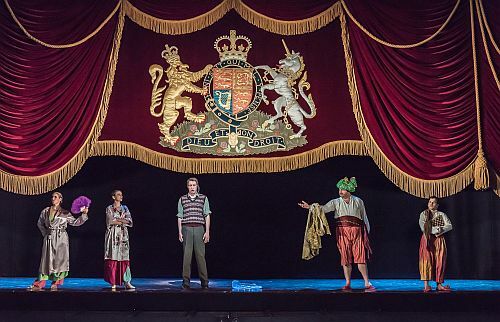 With just one performance left another Royal Opera season was soon to end and immediately before that there was the annual opportunity for the Jette Parker Young Artists to be in the spotlight on the main stage. All get the opportunity to perform smaller roles throughout the season and their progress can be monitored that way. But this end-of-term operatic potpourri allows an audience to see and hear whether these undeniably talented singers – some of whom are ‘graduating’ at this performance – might have genuine ‘star’ quality. The Jette Parker Young Artists Programme is sponsored by Oak Foundation, an international organisation founded by Jette and Alan Parker in Switzerland in 1998 to promote all manner of non-profit-making good causes including the environment, human rights and social integration. The Royal Opera’s Young Artists Programme was instigated in 2001 and since then has furthered the musical development of professional singers, conductors, directors and répétiteurs. They spend two years at the Royal Opera House as full-salaried members of the company, receive coaching in all aspects of opera production and are cast in the small roles and cover larger ones in the Royal Opera repertoire. For once there was some attempt to connect one ‘bleeding chunk’ with the next and this year’s matinee concert was given the title Betrothal and Betrayal. All but one of the singers on the current programme was involved, as were the pianist, répétiteur/conductors and stage director. It was semi-staged with the Orchestra of Welsh National Opera in the pit and we heard excerpts from operas by Verdi, Cilea, Bizet, Berlioz and Gounod. The performance was dedicated to the memory of Michael Kennedy who died last New Year’s Eve and was a journalist, author, and highly-renowned music critic. Though I had read much that he wrote I never met him until last year when he was particularly gracious about a Wagner lecture I gave that he was present at … and this was typical of the man so I understand. He wrote a very important biography of Richard Strauss and he was a particular expert on that composer so it was a great pity no opportunity was taken to put some Strauss into the young artists’ showcase. The only unifying feature of these performances is often a set from an opera currently in the repertory. In this case it was Paul Steinberg’s two huge faux wood panelled walls from Robert Carsen’s 2012 production of Falstaff which would reach the end of its current run later the same evening. Given the furore of the recent updating of the Royal Opera’s new Guillaume Tell the excerpts we saw seemed faithful – possibly ironically so – to ‘traditional’ stagings of the works performed and costumes were mostly heavy coats, waistcoats, breeches and boots for men and formal gowns and harem pants for the women. Obviously with a nod to Falstaff, Betrothal and Betrayal began with the Overture to Nicolai’s Die lustigen Weiber von Windsor (The Merry Wives of Windsor). Perhaps it was where I was sitting towards the front of the stalls but their Royal Opera counterparts do not always sound as good as the Welsh National Opera Orchestra did in their guest appearance in the pit prior to their short season at Covent Garden. This overture from his last opera is just about all that we now regularly hear of Nicolai’s music: it had much of the requisite romantic spirit under Jonathan Santagada but as a ‘curtain raiser’ the raising of the curtain seemed a long time in coming! When it did eventually happen it was on a scene from Act I of Verdi’s Simon Boccanegra where apart from those walls mentioned earlier there were just three chandeliers and a table. Neither Anush Hovhannisyan (Amelia) nor Samuel Sakkar (Gabriele) impressed as Verdian ‘leads’ but James Platt (the only British singer we heard) with his voice of imposing authority seems born to play aged – probably often bearded – characters such as Fiesco and later Gounod’s Frère Laurent. The conductor was the experienced Paul Wynne Griffiths but he could do little to prevent a sense of ennui settling over this scene. Another Act I excerpt followed – this time from Cilea’s Adriana Lecouvreur. Despite this performance being for the young artists the veteran soprano Nelly Miricioiu – one of a number of distinguished singers who mentor them – was given the opportunity to join them as the eponymous heroine. I am sure she has done many wonderful things in the past but time moves on. Current Royal Opera Principal Jihoon Kim also guested and impressed more as the Prince. Greg Eldridge and his movement coordinator, Jo Meredith, created the backstage bustle of Cilea’s opera very well and it was so much better than the much more static Verdi. Samuel Sakker now caught the eye as a rather fey Abbé which may suggest his future lies in character roles. He was part of an excellent ensemble for this scene led by Yuriy Yurchuk’s impressively lovelorn Michonnet, the stage manager, who is infatuated with the ‘young’ actress Adriana Lecouvreur. Once again Paul Wynne Griffiths was unable to do little more than just accompany the singers. Just like ‘a game of two halves’ everything was much better after the interval. Eldridge fully embraced the orientalism of Bizet’s Les Pêcheurs de perles and Samuel Dale Johnson as Zurga and Lauren Fagan as his love-interest, Leila, were simply superb. She slinked around with perfumed exoticism as the beautiful young princess and he could barely contain his passion for her despite some stock operatic emoting that may – or may not – have been deliberate. These two fine singers proved they were worthy of headlining any Pearl Fishers cast and deserved the prolonged ovation they received from friends and family, as well as others, when the curtain closed on their Act III scene. Michele Gamba had the baton here and he also deserves much praise for bringing this scene to dramatic life. Irish mezzo-soprano Rachel Kelly was equally fine in ‘D’amour, l’ardente flamme’ from Part IV of Berlioz’s La Damnation de Faust sung simply in front of the curtain. Here the tragic Marguerite is awaiting execution in prison but still pines for Faust. Rachel Kelly brought great regret and restraint to the wistful aria, with its strangely soothing, rather Wagnerian, orchestral backdrop that Paul Wynne Griffiths drew out from the splendid orchestra. To conclude Betrothal and Betrayal, Eldridge brought us Gounod’s take on the tomb scene from Romeo and Juliet with simply an altar, a candelabra and later a catafalque and a couple of suits of armour. It is just some typical opera by numbers even though the regret is as palpable as is was in the Berlioz and here it is tinged with dread and despair. His Juliette – under Frère Laurent’s urging – has taken a sleeping potion and is mistakenly put in the family tomb. Roméo is unaware that she should wake up soon and so he drinks poison but seems to have completely forgotten this and they are implausibly reunited. When he does succumb she eventually stabs herself. Kiandra Howarth – a finalist in Plácido Domingo’s 2015 Operalia singing competition – was a moving and very convincing Juliette. Her Roméo was Luis Gomes and he is a stylish singer with elegant phrasing and a bright tone; he looks suitably boyish but is not the ideal romantic hero. Paul Wynne Griffith brought out more of the desperation, plaintiveness and hopelessness in the two young lovers’ situation than Gounod’s rather prosaic music possibly deserved. Gounod’s Roméo and Juliette perished with a backdrop of a field of stars. There was an extensive list of Jette Parker Young Artists alumni printed in the programme and how many ‘stars’ there are in that operatic firmament I am not certain since some names are familiar, some forgotten. I am sure their participation is a boost to their careers even if they do not always seem to return to the Covent Garden stage as often as they perhaps could. For more about the Jette Parker Young Artist Programme go to http://www.roh.org.uk/about/jette-parker-young-artists-programme .